Tips for making great hot wings at home. We cut the wings into flaps and drummies, discarding the tip (or freezing them to make chicken stock later), then dry them thoroughly with paper towels. It’s important to dry them thoroughly before baking. This helps prevent the skin from shrinking up. 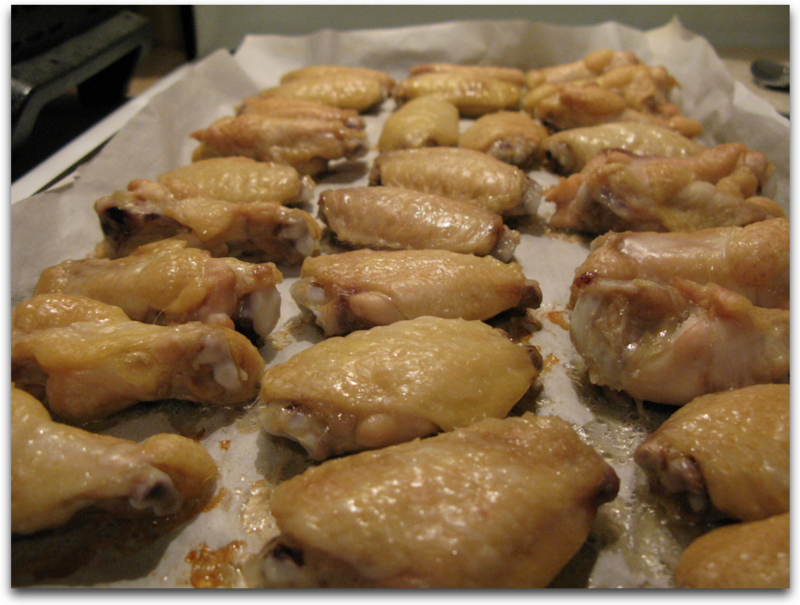 Season the wings with salt and pepper or your favorite spices like Tony Chatchere’s or Todd’s Dirt or a jerk seasoning (Captain Thom’s Jerk Seasoning), and stick in the fridge to air dry uncovered for an hour or so – even overnight is ok. If you’re using a wing sauce with a lot of salt, bake them plain. Bring the wings to room temp. Place them on a baking sheet lined with parchment paper. 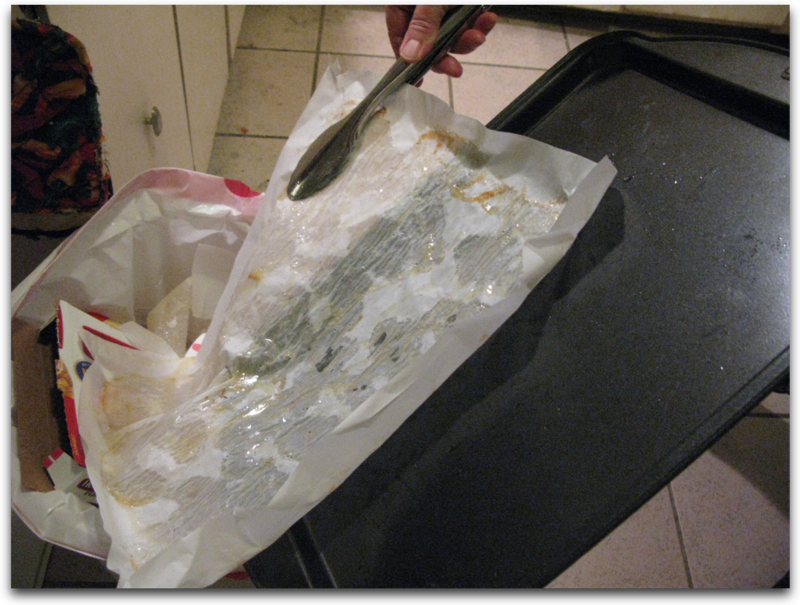 Note: If you’ve ever baked wings on a baking sheet, and sprayed it with oil, or coated them with oil to keep them from sticking, you know you have a sticky mess to clean up. USE PARCHMENT PAPER (no oil needed) and you and your dishwasher will be happier. We promise! Bake at 375 degrees for 20-30 minutes. Remove the wings from the baking sheet and let them “dry out” on a platter for at least 10 minutes to absorb any excess moisture (water & fat). 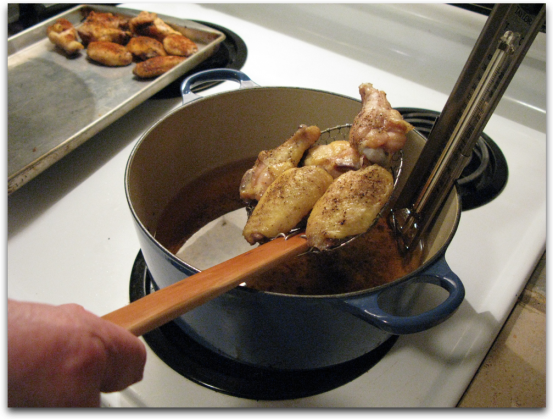 Fry in small batches, 5-8 wings at a time. We fry our wings in our Le Creuset Dutch Oven. We used to use a FryDaddy deep-fryer, but it doesn’t hold the heat as well as a good enameled cast iron Dutch oven does. If all you have is a FryDaddy or other electric fryer, just allow time between batches for it to heat back up, because each time you place food in those fryers, the oil temp drops. After deep-frying, place briefly on paper towels to absorb the excess oil, then toss them in your favorite wing sauce while they’re still hot. 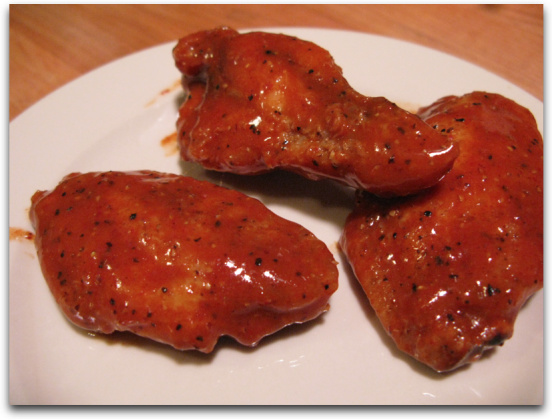 Let them sit a minute to soak up the sauce and regain their crispiness, and you’re ready to enjoy perfectly cooked wings! Serve with celery sticks and our easy to make blue cheese dip. For a new and different twist, try some cucumber spears along with your favorite ranch or blue cheese dip. NOM! Sadly, 44 Wings are Out of Business. That’s right, on Day 4 of Week of Wings we’re featuring the “44 Wings” brand sauce from Tampa, Florida. Ken Michaels of 44WingSauce.com sent me his “Medium” and “Hot” versions to review. This is a review of the Medium sauce. Marilyn, a.k.a. @HotSauceChick on Twitter and I both agreed that the Medium is a great product. This is a wing sauce that has all the ingredients already mixed in. Just heat before using – yet another wing sauce that needs to be heated before use, but at least the instructions are on the label. And there is no reason to add anything else. Our initial impression is that it has a nice consistency, light and perfect for coating your wings. 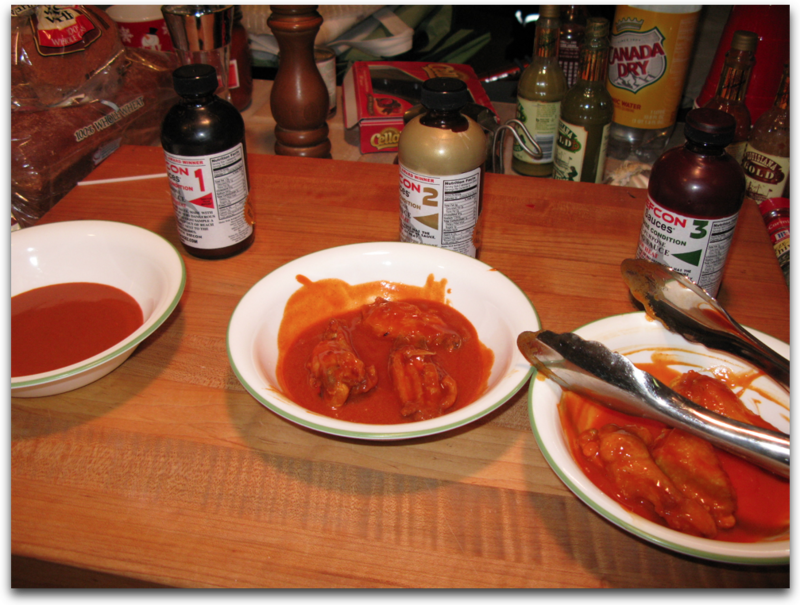 After baking and frying the wings and tossing them in this sauce, the vinegar edge first detected when poured from the bottle gave way to a sweet, fresh flavor. A wonderful infusion of herbs, spices and honey gave these wings a unique flavor profile. 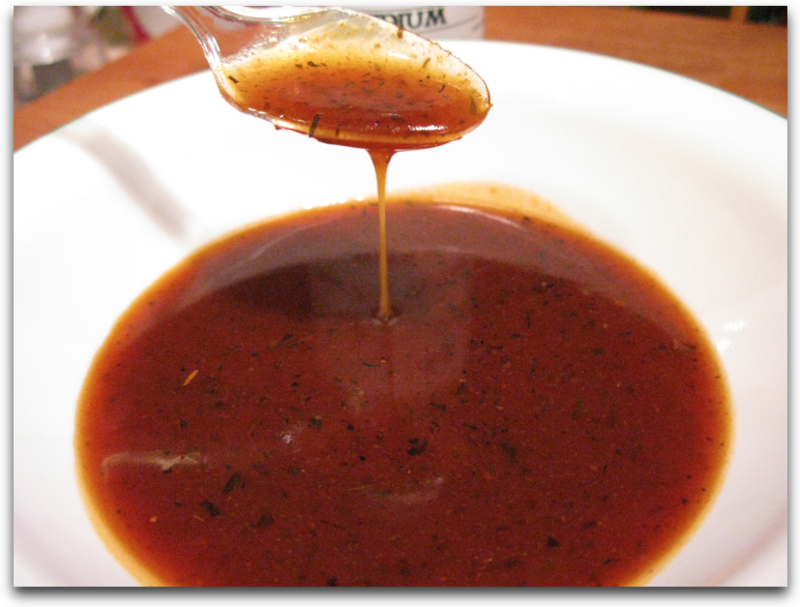 I love the aromatic essence that rosemary and other herbs lend to chicken, and, though not listed (various spices), they are definitely present in this sauce. If there ever was a “gourmet-style” wing sauce, this would be it. In fact, it could be marketed as a “Gourmet Glaze”, as it would be perfect on ribs, shrimp, and poultry. Ingredients: honey, peppers, vinegar, salt, partially hydrogenated soybean oil, butter flavoring, and various spices.